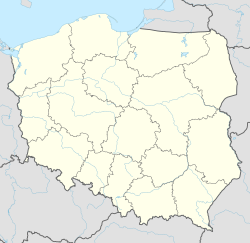 Wicimiczki [vit͡ɕiˈmit͡ʂki] (German: Neu Witzmitz) is a village in the administrative district of Gmina Płoty, within Gryfice County, West Pomeranian Voivodeship, in north-western Poland. It lies approximately 10 kilometres (6 mi) north-east of Płoty, 14 km (9 mi) south-east of Gryfice, and 73 km (45 mi) north-east of the regional capital Szczecin. Before 1945 the area was part of Germany. For the history of the region, see History of Pomerania. ^ "Central Statistical Office (GUS) - TERYT (National Register of Territorial Land Apportionment Journal)" (in Polish). 2008-06-01. This Gryfice County location article is a stub. You can help Wikipedia by expanding it. This page was last edited on 22 March 2017, at 04:28 (UTC).